Saving - Helpful Hints - Problems? Do not allow yourself to feel "less of a teacher" if a student knows more about the technology than you do. Since many adults and students are self-taught these days, it is very likely that your circle of knowledge and that of a student will differ. Celebrate the fact that she can help you (assuming she is trustworthy), and use this as an opportunity to remind all students that adults are life-long learners. Thank her for teaching you something new and go on. Spell out specific and harsh consequences for students who use the computers for unassigned tasks during your class. These will vary by grade level. With secondary students, loss of points usually works. No negotiating. Consider making these policies public to parents on your web page and in a written contract signed at the start of the year. If your school requires signatures on an Acceptable Use Policy, spell out your classroom consequences at the same time. Remind students of the agreement every time you start on a new project. Resist the urge to grab the mouse for the student who is in trouble. Try to talk him or her through the problem solving. She/he will remember better! Require all student helpers to do the same. Remember to shut down all computers properly when you leave a computer lab or put laptops back in a cart, unless there is a building policy otherwise. Do not allow students to change settings. This is a matter of courtesy to all who use the lab/laptops after you. For classroom lessons using a computer and projector, arrange your room so you have to move as little as possible to hook up and use the projector. This may take some imagination. No one says a computer has to be at the back or hidden. Make it the center of the room! A "technology island" can be a gathering place. On your classroom computer or computer cluster, organize the Favorites (Bookmarks) in folders that students can understand: by subject, by unit, or by some other logical category. Teach and use one new tool at a time until students have mastered it. The first time they do a project using a tool or new software, they will focus on the tool more than their content. And you may just be learning the tool along with them. The second time, they will become more discriminating and comfortable. The third time they will discover nuance. Add new tools ONLY after the former ones become routine. If you team teach, work together with other teachers on this continuity. As student progress from grade to grade in elementary, tell the next year's teachers what tools the students know well. Find out early in the year how many of your students have computers and Internet access at home. If you do decide to assign work on the Internet, allow a few days, not just one night, since students often must share the home computer with other family members. Decide in advance how you will handle work that has obviously been completed by someone else. Decide how to handle the need for make-up work or extended work time on a project. Consider teaming with other teachers to offer before- or after-school computer time. Check availability of computers in your students' study halls or at recess. If possible, arrange for the parent organization to arrange some parent helpers for extra work sessions. If your tasks are spelled out clearly on a web page or document, parents can assist stragglers. The first time you do a technology-based project, keep it simple and use the opportunity to find out who has more technology experience and skills. Then pair or group students for future projects so each group has someone "tech savvy." Set a mouse timer with younger students, so each member of the group gets to operate the computer for an equal amount of time. If students are working on individual computers, set a timer on the interactive whiteboard or projector so all students can see how much time remains and stay on task. Use a tool such as the Online Countdown Timer. Check URLs on the school computers in advance. Sometimes sites that seem perfectly innocent to you (and worked at home) will be blocked at school due to bandwidth usage or other odd filtering choices. Be prepared to use alternatives if your school does not move quickly to unblock by request. But definitely find out before you have 30 eight graders shouting, "It doesn't work!" Prepare a thorough assignment document or web page with all links and instructions for any project using the computers. Make accessing and opening this information the first task of the project. If you do not have access to place the assignment on a web page, save it as a document on a networked drive accessible from all computers. Always put the assignments in the same place, so you only need to teach this process at the start of the year. With younger students, make a graphical "task map" showing the steps they are to complete. Put it on the desktop of the classroom computer center AND print it out so students can trace the steps with their fingers. When working with younger students (grades K-2), make a shortcut directly to the web site or electronic handout on the desktop of the computer. Experiment with RIGHT-clicking while on a site to make the shortcuts. A menu will give you the option to "make shortcut" and place it on the desktop. Some operating systems/ web browsers will allow you to make the window a bit smaller and actually "drag" the small icon at the start of the web address (URL) to the desktop, creating a shortcut. RENAME the shortcut (Right-click to choose "rename") with words your worst readers can recognize. Try using a Wiki in your classroom for communication and collaboration. Not comfortable with wikis? Check out the Wiki Walk Through. Develop a list of students who are good helpers (who do not do the work FOR peers, but coach them through it). Offer them ways to earn extra credit or trade for assignments by doing this after their own work is done. Require these experts to keep their hand clasped behind their backs when giving help so they do not grab the mouse. A variation on the helper method above is to have one or two students work with you when you prepare prototype projects using new tools. Discover the features and foibles together, then allow these students to be your "experts" when the entire class does the project. You will be modeling that learning is something we can all do together. With middle and high school students sharing limited computer access (one or a few classroom machines), have them sign up for "studio time" as if they were renting it -- the way television producers rent studio time. Treat studio time the way it is done in the real world: Time is money. Groups should be prepared to maximize their productivity during their limited time. Give each group an equal allotment, but offer extra time coupons as incentives. You might, for example, give extra studio time to those who test out of that unit's content early, whose project proposal is particularly outstanding, who volunteer as helpers for struggling students, etc. Have assigned seats in the computer lab or for where students use laptops in your classroom. Place learning support students along easily-accessible aisles and near the front so an aide or helper can fit next to them and/or you can circulate to them easily. Make sure you have a clear path to see all monitors while students are working in the computer lab or on laptops. You can use this to collect scores as they finish work (you will see their finishing screen). In the computer lab, or or with laptop carts, keep a written record of which student used which computer (date, time). This comes in handy for tracking down Internet use that is inappropriate. During direct instruction or demonstrations, have students place the mouse (mice!) on top of their monitors or turn off the monitors so they cannot be using their computers while you want their full attention. 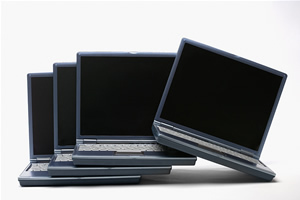 With laptops, have them lower the screens to a position only about 2 inches above the keyboard. Select a student to run the computer/whiteboard for demonstrations so you can circulate as you talk. This can be someone who (a) thrives on attention, (b) will be extra cautious in front of peers to avoid embarrassment, and (c) follows oral directions. Sometimes you can "win over" a troublesome student this way. Sometimes a learning support student turns out to be very good with demonstrating skills and can "look good" in front of peers. Make a printed assignment sheet or web page of all computer directions for those who do not follow your oral directions. They can prop it in front of their keyboard or have it open in a second tab or window. Refer them to this when they ask what to do next. Consider offering a graphic version with minimal words for your visual learners and/or poor readers. For complex tasks, especially the first time you do a major project, spell out daily benchmarks for what students should have completed by the end of class. Include this checklist in the assignment sheet or web page. If some students have better time management or an alternate approach to the task, you can grant "exemptions" as you wish. Realize that the more creative the task, the greater the variability on how students will approach it. You may want to start out with a more straightforward task until you learn more about your students. In computer labs or with multiple laptops, use a signaling system for help and be consistent with it. Cups on a string or sticky note "flags" placed atop the monitor/screen work well. Give no help to those who do not seek the help of a neighbor first. Reward trios or pairs who are mutually supportive. Rotate the responsibility of sitting next to difficult peers. When working with clip art, graphics, animations, or anything "glitzy," limit choices for most students -- at least to start with. Making decisions takes them a VERY long time if they have unlimited options. Three or four options are plenty for elementary students. When printing in computer labs or to a networked printer, give one or two students (the first ones done) responsibility for standing at the printer and delivering completed work to others. No one else gets up. As the teacher, collect the work at the end of class at the door. To save paper, require students to ask permission before they print. Take off points or penalize those who "accidentally" print over and over out of impatience waiting for the print queue (penalty depends on the age). When working in a computer lab, give frequent "By now you should have ____done. If you do not, you are behind," reminders. If you need to, set a time to help YOU keep track of time. Use a record keeping folder at the classroom computer for students to record scores, or have them put up a silent signal (flag, cup, etc) when they finish a task so you can verify it. As you rotate students for time at classroom computers, realize that elementary students will have "WOW! moments" they cannot squelch as they make new discoveries. Allow one "WOW moment" per rotation at a time when YOU announce it. Ex. As you are working with guided reading groups and others work at computers, stop between questions in your group for a general classroom announcement of any "WOWS!" from those at the computers: "Let's stop for a quick WOW break... does anybody at the computers have a WOW to share?" This will teach them to hold their excitement for the appropriate time, and it will also get others excited for their turn at the computers. You can also allow the guided reading group to share a WOW. If your school is a BYOD or 1:1 school, and you would like all of your students to use the same tools, check out our collection of reviewed, device agnostic tools available as FREE web tools and iOS or Android apps. Have copies of any files YOU plan to use with students saved in more than one place. Email them to yourself, use a USB stick, use a shared folder, etc. Where possible, use networked storage as your required place for students to save. They can save a copy on a USB stick to take home, but the "master copy" remains safely at school until replaced by any changes the student brings in later. Have students ALL do a "Save as" immediately after they start a computer assignment to be saved and/or printed. Have a neighbor verify that each student has named the file according to the required instructions for a MEANINGFUL file name before the student who created the work clicks the "save." This check should include the location AND name of the file. This way students can use control+S as a quick save while working. When students work on computers, give loud oral cues every five minutes reminding students to save (Control-S) and then to keep on with their work. If you have a pesky student who watches the clock, turn the SAVE MINDER job over to him/her. Online collaborative tools such as Google Docs (reviewed here) often allow saving of projects right on the web site. These require membership, however. Make sure you know school policies about student memberships (see more tips on the TeachersFirst Edge Tips). Some tools automatically save at regular intervals, but you should always remind and pester students to save anyway. Many of these tools require an email address. Read tips for safely managing email registrations here. Another method to save/share work ”in the cloud” is Dropbox. Any document that you save on Dropbox is accessible from any Internet-connected device. Simply copy, save, or move the document into Dropbox. Students can easily put work into your Dropbox account if you set up a shared folder. A Dropbox add-on called Share my Box helps you organize student submissions. USB "sticks" (also known as "thumb drives," "flash drives," etc.) are a terrific way to save large files and/or move them from one computer to another. Make sure your school computers ALLOW these sticks to work and that files can be read from sticks students bring in from the outside. Some schools prohibit them as potential carriers of viruses, worms, etc. Find out in advance! If you use USB sticks, require students to save in MORE than one place, i.e. on their own stick AND in an online file storage service, as an email attachment to themselves or you, on a buddy's stick, or a classroom stick. This will avoid "losing everything" if the student forgets the stick the next day or runs it through the washing machine at home! When it comes to saving, TWICE is mandatory, thrice is nice. If you are unsure of the reliability of a USB stick, always save to the desktop first, then Save as to the stick. If the stick is bad, you still have saved your work. If you temporarily saved items to the desktop or hard drive in the computer lab, remember to go back and delete them. This is the equivalent of picking up your own trash. In the computer lab or on multiple laptops, always stop at least three minutes early to get all files saved, programs closed, and USB sticks put away. Note that MANY computers get "upset" if you remove a USB stick before you close the program and/or "Safely Remove hardware." To avoid this, have students close all programs and run the "safely remove" before removing sticks. Teach all students who plan to carry files anywhere about saving word processing files as .rtf so they can be opened on any word processor. Do not assume that even tech-savvy high school seniors (or their parents) know this. If they plan to take a file home or bring one from home, they should save twice: once in the "normal" format and once as .rtf (Rich Text Format). Remind students that you can have more than one program open at a time in Windows. This is especially handy when copying and pasting typing, clip art, or any work from one file to another. If your machines are very old, they may not "like" running more than two programs at a time. If they become sluggish, close a few windows to get your total back down to two. The more graphics you are using, the slower they will become. If your district blocks YouTube, you can still share a specific video with your class. View the videos at home and bring them to class "on a stick" to share. Use a tool such as KeepVid to download the videos from YouTube. Using YouTube in your classroom? Remove all of the “clutter” and advertisements using a tool such as SafeShareTV or Quietube. Use a site such as ClipNabber to grab favorites from online video sources such as YouTube and Dailymotion quickly and easily. Skip the parts that you don’t want to use and combine the clips that want! SAVE CLASS TIME! Teach students how to "undo" in the programs they are using! Control key and Z together! Teach all students to stop and pull their hands off the computer keyboard (up in a "hands-up" gesture), and think when something goes wrong. This will prevent "mouse panic" where the student madly clicks and makes the problem worse. Usually a simple "undo" will solve the error. Know your school's procedure for reporting technical problems and USE it. Leave a note on the board or prominently on laptop carts for teachers who follow you (date and sign). Do NOT assume that this note will "get it fixed"! Be courteous in reporting problems in accordance with procedures, or others will figure out it was YOU who did not report them.